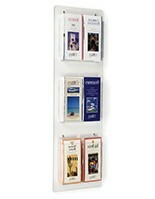 Are you shopping for a brochure wall display to organize all of your literature in your lobby or waiting room? This hanging magazine rack is the answer. 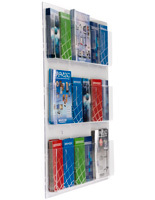 This brochure wall display, also called a literature holder features 12 pockets that can hold standard 8.5" wide size magazines. These twelve compartments can easily be converted into 24 slots to house 4" wide pamphlets. 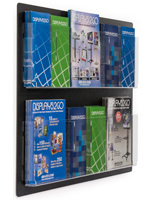 This brochure wall display features a clear acrylic design with a black plastic backer. These neutral tones enable this mounted flyer organizer to blend with any type of commercial setting. 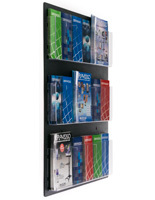 The mounted literature rack, brochure wall display offers an unobstructed view of all of the magazines. 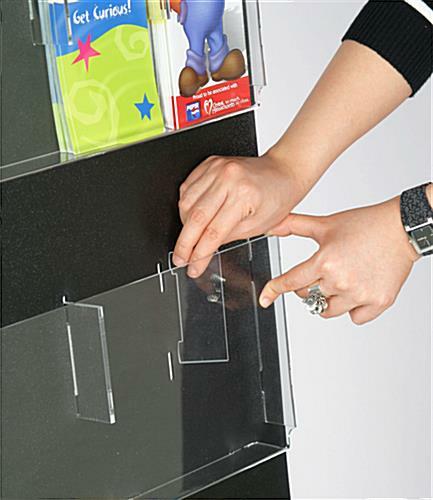 The tall acrylic panels also help to prevent single-sheet flyers from flopping over. 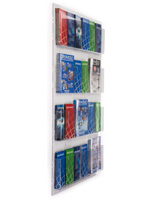 Each brochure wall display, also called a pamphlet dispenser has four pre-drilled holes; one in each corner, for ease of installation. The included pocket dividers snap into place with no tools or accessories. This brochure wall display requires two people to properly install this unit. All of the necessary hardware; screws and anchors are also included with every purchase. 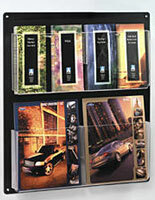 This brochure wall display is often seen in travel agencies and car dealerships. 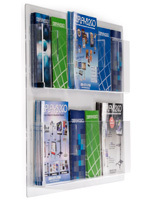 Buy this magazine rack to keep literature looking neat and tidy within an office environment. 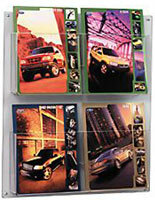 This brochure wall display is also offered with a clear backboard, as well as other pocket configurations. Thanks for another awesome review, Jill! Great Product for all of the marketing material in the branches. Makes it look much nicer and less congested! Awesome, Kelly! It's always a struggle to keep marketing materials tidy. We're happy to hear this worked out so well for you! This product came within 3 days of my order date. It is very durable plastic and looks just like the item pictured online. We carry a lot of informational material and it holds the weight amazingly!! Thank you for the great review, Jenna! That is great to hear. The wall mount works great. It provides a more professional appearance for displaying literature. We just moved into a new building and wanted to do something with all of our literature for our customers and sales reps so that everything would be more accessible and look more professional than hunting through boxes and boxes of literature and then making a huge mess in the process. This product was exactly what we were needing and looking for. Everything shipped within a few days, all parts were in the boxes, nothing was damaged, very easy to install, does not take up any floor space which is a plus, and we can put the small pamphlets in as well as magazine size with a simple divider that comes with the product. We ordered 5 of them to see how they would look and everyone loved it and we just ordered 6 more. Our operations manager was in this week and loved the idea and he will be ordering a lot more of these for all of our other locations. The picture I provided is only the 1st set that we ordered we should be getting the 2nd order in a few days.